Fitbit is one of the most popular fitness trackers on the market. With the amount of time that people typically wear them, it’s a fair question to ask, does a Fitbit emit EMF radiation? From the extremely simple Fitbit Zip to the smartwatch style Fitbit Versa, these devices are worn by millions of people to improve their health through calorie tracking, heart rate monitoring and more. Some of the different models have gotten bad reputations for causing skin irritation, burns, and wrist pain. Some of these were attributed to allergic reactions to the metals used, but many other symptoms from wearing Fitbit fitness trackers can easily be attributed to the EMF radiation from the devices. I wanted to look into this a bit deeper to find out what we know about the dangers of these fitness trackers, and what we can do about it. Just a quick aside – I just want to mention that if you’re worried about EMF radiation, there is an E-book that I absolutely cannot recommend any higher called “The Non-Tinfoil Guide to EMFs” that I would really encourage you to check out. I didn’t write it, but it’s one of the absolute best resources available. Does A Fitbit Emit EMF Radiation? First of all, the answer is yes, Fitbits do emit EMF radiation, primarily from their Bluetooth connection with your phone. 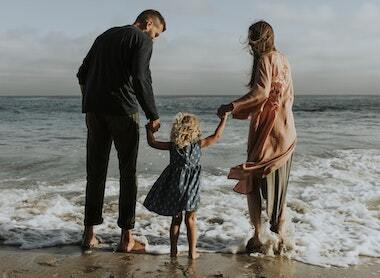 Although the non-ionizing radiation from Bluetooth devices does not always emit as much EMF radiation as say, your cell phone, the constant connection does emit a fair amount. For a full in-depth look at the dangers of Bluetooth EMF radiation, check out this post. Let’s take a look at a video showing EMF radiation being emitted from a Fitbit. One issue with Bluetooth radiation from a device like the Fitbit is that there is less research available. In fact, even with the small amount of research that is available, you have to weed through the mire of research bias, as many of the studies are funded by mobile phone and Bluetooth device manufacturers. Most, but not all, Bluetooth devices have EMF radiation emissions slightly less than then government regulation standard SAR (Specific Absorption Rate) levels. However, some research now tells us that these levels are far from what is actually safe for the body to absorb. Many scientists and researchers claim that this low-frequency non-ionizing radiation is not harmful, because it is nonthermal and has no heating element. However, even in the scientific community, this is far from settled, as there is a growing body of research showing that this radiation can, in fact, be quite harmful. Bluetooth radiation from devices like a Fitbit, as you probably saw in the video above, happens in pulses. The EMF radiation from these pulses is an extremely short wavelength that travels at very high speeds and is extremely efficient at penetrating human tissue and can potentially cause biological damage. As well as more serious issues like increased risk of cancer, heart disease, Alzheimers and more. Another issue that I, and many others, have with the Fitbit, is that they are generally worn while sleeping, as many of them track and provide information about your sleep patterns. In a recent study, it was discovered that EMF radiation can significantly impact our sleep by inhibiting the bodies production of melatonin. The body interprets the EMF radiation as light, and so the pineal gland, where the melatonin is produced, believes there is daylight and does not want the body to sleep. This is often the reason that people have trouble sleeping in a room with a significant amount of EMF radiation, and why I recommend cleansing your room of most of this radiation. See my full post on EMF radiation in the bedroom for tips on this. The Aria 2 is FitBit’s WiFi-enabled smart body weight scale. The device not only measures your weight, but also your BMI, body fat, and many other health statistics. It accomplishes this in a few ways. 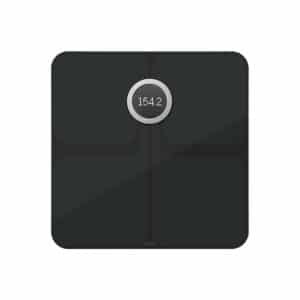 First, it gathers your weight through the typical means, sensors in the scale. It then measures the other statistics by sending an electrical signal through the body, up one leg and back down the other. When that electrical signal arrives, the Aria is able to roughly determine your body fat, BMI, and other things. Next, the scale sends that data to your phone via WiFi and syncs with the Fitbit App. This allows your phone to maintain all the data that the scale collected. Although Fitbit (and most other smart scales) claim that this electrical signal is harmless, there seems to be some anecdotal evidence that this may not be the case. Many people have reported feeling quite sick after using the Aria 2, including nausea, headaches, and fatigue. However, it may not, in fact, be the electrical signal that is specifically causing the harm, but the EMF radiation emitted from the device while collecting data, transmitting data, or just remaining connected to WiFi. If you’ve read many of the other articles here on EMF Academy, you know that WiFi-enabled devices emit a form of EMF radiation called Radio Frequency radiation. This is the same type of radiation that your cell phone emits, and the damage has been shown to be cumulative. So although the Aria is not going to emit as much radiation as your cell-phone, the effects from it, combined with all the other radiation sources in your life could potentially be quite damaging. On top of the radio frequency radiation, you’ll also find that the Fitbit scale some magnetic, and electric field radiation as well, especially when pulsing the electrical signal through your body. Although these scales offer a ton of convenience, I personally do not think they are worth the increased exposure risks. Is The Green Light On My Fitbit Safe? 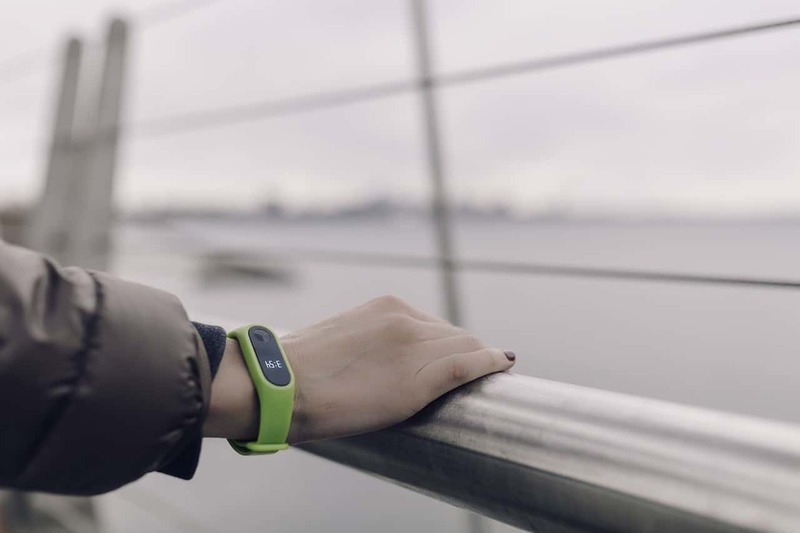 Many Fitbits include continuous heart rate monitoring that can be viewed on your phone. For the vast majority of people, the green light that provides this heart rate monitoring is perfectly safe. Fitbit uses a technology they call “PurePulse.” PurePulese is a simple green LED light on the visible spectrum, that they say is similar to other lights around you. It is extremely low powered, non-thermal, and the devices are programmed to shut it off if there is any malfunction. Essentially the Fitbit shoots this green light in pulses and records information on its reflection to be able to determine your heart rate. The light itself for anyone that is not allergic to visible light, is perfectly safe. The danger is in the continuous monitoring information being sent to the phone. This transmission via Bluetooth does emit EMF radiation. Can You Turn The Green Light Off On The Fitbit? Yes, if you find the heart rate settings either on the device or on your connected phone and turn off heart rate monitoring, the green pulsing light will stop. Are The Rashes Caused By Fitbits Caused By EMF Radiation? It would appear that the vast majority of the significant rashes are caused by other issues. 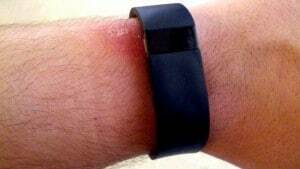 in 2014 there were over 10,000 complaints of rashes and skin injuries caused by the Fitbit Force. The company recalled the device saying that the rashes were caused primarily by an allergic reaction to an adhesive used in the bands. After re-releasing new versions there were continued complaints about rashes that the company said were primarily caused by allergic reactions to nickel used for the device. Although the majority of these rashes have been resolved by the company, complaints still seem to occasionally come in. I would say that it is unlikely that a significant rash would be a result of the EMF radiation caused by the Fitbit, but is more likely to be caused by either improper wear, or an allergic reaction. Although skin irritations are often a symptom of sensitivity to EMF radiation, especially from long-term or close proximity exposure, so I would not completely rule this possibility out. If you are worried that this might be the case, consider getting an EMF meter like the one I use, the Trifield TF2 (read my full review). What Does FitBit Have To Say About Radiation From Their Devices? Many people have asked the company about radiation from their devices, both about the radio frequency radiation from the Bluetooth, as well as the small amount of electric and magnetic field radiation from the device itself. Fitbit has maintained a pretty consistent stance, that although their devices absolutely do emit EMF radiation in several forms, the amount of radiation is not enough to cause harm. The only thing that bothers me about this response, is that it does not link to the results of any testing showing these numbers. Also, what cell phone radiation results are they referencing when they say that the Fitbit only emits approximately 1% of the amount. Also, are these numbers accounting for the fact that a Fitbit device is work directly against the skin, and many cellphone radiation results assume a 6-inch distance between the person and the device? They are certainly correct that in a direct comparison a cellphone is going to emit more radiation, however, I wish they would release their own tests and studies so that we could actually make a determination about how dangerous these devices are. Again, I have some small issues with this response. It hints that perhaps the numbers they are using for comparison are related to SAR testing of cell phones. If you read my post on SAR ratings of cell phones, then you’ll know there are many reasons that these readings are far from accurate. SAR readings are based on an adult brain. However, children absorb approximately twice the radiation of an adult and are therefore not factored in by SAR ratings. SAR levels only give us information about how much radiation they emit when in use against the body, but do not tell us about how much radiation they emit when not in use. The dummies that are used for testing, contain only a liquid that is representative of our tissue and brain matter. However, many people have metal on their bodies in the form of fillings, piercings, etc. This metal can impact how our bodies absorb radiation. The statement from the forum moderator also says that devices like theirs are exempt from testing. Although this is true, it certainly should not make you feel safer. The FCC guidelines on EMF radiation limits are FAR off from what most countries consider safe. Powerful corporations and lobbies fight to keep these guidelines where they are so they can continue manufacturing electronics that may be unsafe, and be exempt from even testing them. A growing number of scientists and researchers are fighting these guidelines, with aims to get them closer to other industrialized countries. On top of that, I’m not sure they are correct with their radiation assumptions. Take a look at the following video which measures the pulsed radio frequency radiation from a Fitbit. Watch as it actually maxes out the Acoustimeter’s Radio Frequency measurements at over 6 v/m2. 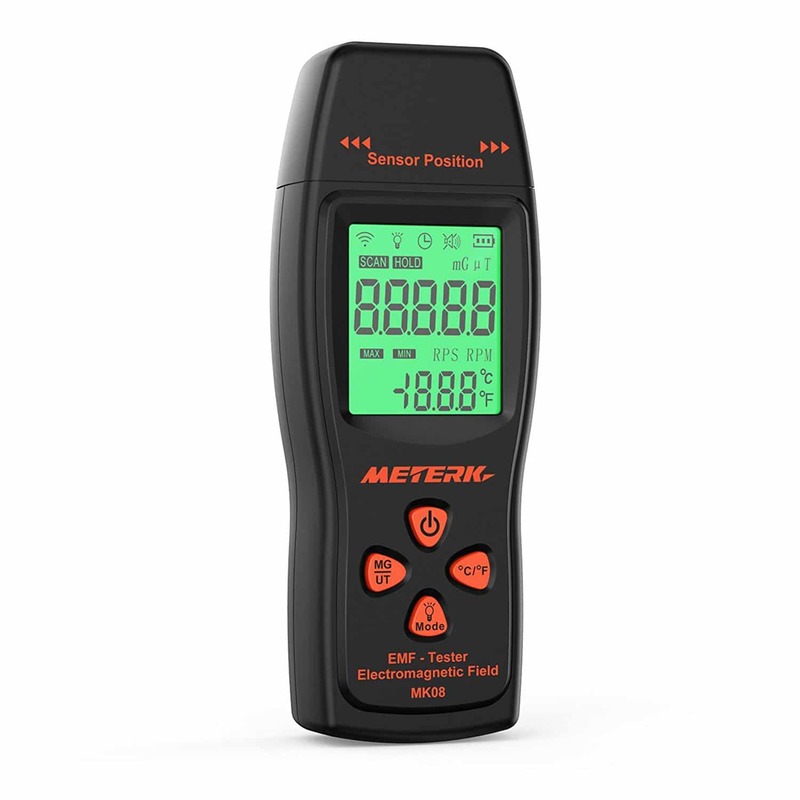 If you want to measure the EMF radiation from your Fitbit, or just about anything else, you should really consider getting an EMF meter. This is the first tool I recommend to people who are concerned about EMF radiation. It allows you not only to find sources of radiation in your home but also allows you to make measurable changes to improve your health and safety. My favorite EMF meter by far is the Trifield TF2 (read my full review). Should I Be Concerned About My Fitbit Causing Cancer? Although an increased risk of Cancer is often associated with EMF radiation, I would be far more concerned with devices like my cell phone, router, smart meter, and even local cell towers than I would be by my Fitbit. As you’ve likely read in many of my other posts, long-term use of mobile phones has been attributed to a significantly higher chance of developing cancerous tumors called glioma on the side of the brain where you hold the phone. I would say that although the radiation from the fitness tracker should not be discounted, and I don’t personally believe it is worth the risk, I would not be immediately concerned with this. However, we do now know that EMF radiation dangers are cumulative, so anything you can do to lower your long-term exposure, including stopping the use of devices like the Fitbit, will also lower our overall risk. Take this for what it is. Although the moderator is correct that the radiation exposure from Fitbit devices is much lower than cell phones, it does still emit radiation. Also, remember that there are many scientists and researchers that believe the “FCC requirements for RF exposure” are far from safe levels. Does Fitbit Publish SAR Levels For Their Devices? Although cell phone manufacturers are required to publish SAR levels for their devices, Bluetooth device manufacturers are not. I was not able to locate Specific Absorption Rates for any of the Fitbit devices, and I don’t believe they have published them. I think anything we can do to lower EMF radiation in our lives is very smart. We are already blasted constantly from cell phones, cell towers, WiFi, smart meters and much much more. Although Bluetooth fitness trackers like FitBit DO emit EMF radiation, it is not nearly as much as these other sources. Also, if you’re highly sensitive to EMF radiation, I would certainly suggest not wearing such a device as the constant exposure to radiation can make it hard for you to know what is making you feel ill. I hope you enjoyed my article on Fitbit radiation, if you did, please consider sharing it!